Why carry with a backpack holster? 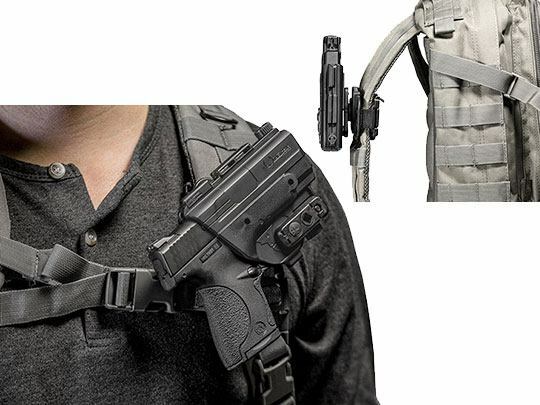 Well, it's not a typical everyday carry set up, that's for sure, but the ShapeShift Backpack Holster provides something all gun owners seek: freedom to carry when and how they want. If one is outdoors in the wilderness — be it hunting, hiking or any other outdoor recreation — the need for self defense doesn't just go away. However, many backpacks can take up precious space on the waistline and remove the option for popular carry styles. This modular holster can be secured to almost any strap within reason, but ideally works for straps between 2 inches to 3.25 inches wide. A backplate, frontplate and lever are fastened and cinched onto the strap, with an integrated mount whereon a Shift Shell is locked. The full Shift Shell configuration offers a 360-degree rotational cant on the mount and completely encloses the trigger guard with a rigid polymer blend. This removes a dangerous attribute of many backpacks with inserts for handguns. They lack adequate trigger guard coverage and, just as importantly, diminish the accessibility of a handgun. Carry with the confidence that you can access your handgun in a split second at a convenient location, while also having your hands and waistline free for other outdoor tools. Worried about being disarmed? The ShapeShift Backpack Holster is compatible with an active retention thumb release. Already have a ShapeShift Holster? Save some money and buy the ShapeShift Backpack Holster Expansion Pack, which includes everything but the shell for this carry style. 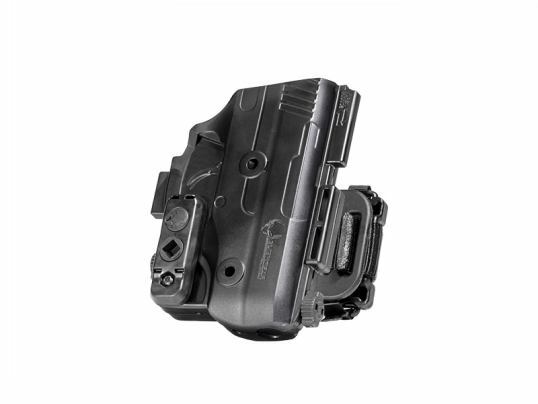 This lowers the cost and leverages the utility of the entire ShapeShift Modular Holster System. The full shell configuration can be removed from the backpack holster mount with the click of a button. It can then be shifted from that mount and secured to an OWB paddle clip, a MOLLE holster adapter or a mount that can be installed in a variety of locations, like a car. Or, reconfigure it in a few moments to fit any of the concealed carry ShapeShift holsters with backers. Alien Gear has devoted countless resources and time to help prepare you for the unknown.